Selected twits from 20 April 2012, in chronological order. @helenpidd: Breivik: “I am not a racist, I am an anti-racist.” Concerned with the “anti-European racism” in the Norwegian media. @helenpidd: Breivik complains that “cultural conservatives” such as himself has no chance of having a letter published in a Norwegian newspaper. @helenpidd: Breivik says he was influenced in a particular bomb making technique by Andreas Baader from the Red Army Faction/Baader Meinhof Gang. @paulrbrennan: lawyer: how can you say that, but you cried when you saw your own film the other day (in court)…? @paulrbrennan: is being asked about journalists, and the fact he groups all together, but he differentiates between politicians. why so? @paulrbrennan: says he differentiates between news and sports journalists…. 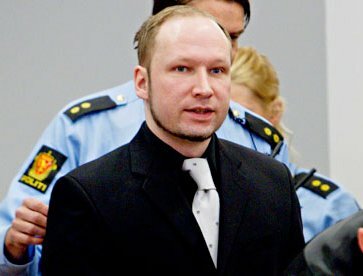 @paulrbrennan: After lunch, #Breivik will be asked more about the ‘categories of traitors’ which he outlined yesterday. @paulrbrennan: #Breivik now to be asked about Cat A-B-C traitors. @paulrbrennan: #Breivik is told that about half of those he killed were less than 18 years old. #Breivik says he assumed they were older. @TrygveSorvaag: Prosecutor takes over and moves over to Utøya. @TrygveSorvaag: #Breivik asks people to leave the room if they do not want to listen to this. @paulrbrennan: #Breivik looked at his notes for a second there. Says he shouted “You are going to die today, Marxists!” at the tent site. @paulrbrennan: #Breivik says when he reached Lovers’ Path again he heard a helicopter in the trees above. Thought police must now be on island. 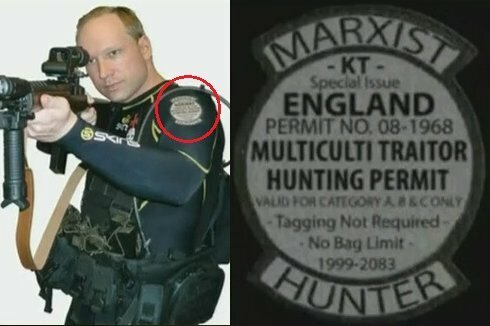 @paulrbrennan: #Breivik: “…and I thought about shooting myself in the head.” Says he remembered his compendium and the plan to face judicial process. @paulrbrennan: #Breivik: remembers helicopter was very close, and wondered why, because new police had thermal cameras and didn’t need to be so close. @paulrbrennan: #Breivik: said he thought ‘my mission is over’, had no intention of firing on the police because they are not the enemy. The journalists covering the story are the enemy however. Here they are fretting about how twitting makes it harder to spin the proceedings their way. As the court’s live TV feed is subjected to a ban on broadcasting any of Breivik’s, or his victims’, testimonies, many people across the globe are likely to choose to follow the Twitter feeds of journalists inside the court room for updates. But free speech blogger Daniel Bennett told Journalism.co.uk he believes substituting reporting Breivik for tweeting his quotes leads to coverage fraught with problems. He also blogged about the issue for Index on Censorship. “The problem for live-tweeting journalists is that it is hard to do any more than simply relay what Breivik is saying,” Bennett said. As Bennett flagged up in his Index blog post, Guardian reporter Helen Pidd, tweeted on Tuesday: “Heading to Oslo today for the Breivik trial. Should I live-tweet proceedings? I’m thinking not. Loath to give Breivik the platform he craves”. And she went on to discuss the ethics of live-tweeting the trial with her followers and colleagues. Twitter users who replied to Pidd’s comments were divided over whether she was justified in this self-censorship. However, Pidd disclosed that her colleagues at the Guardian had agreed that it was “not morally wrong to live tweet the trial” and went on to tweet the proceedings in its minutiae. Bennett believes that the only way to overcome the ethical issues surrounding live-tweeting is incorporating the tweets into liveblogs, and longer articles where there is more space for additional analysis. The most shocking thing about Breivik is how many people agree with his opinions. In his opening remarks to the court, Breivik did not deny responsibility for the deaths of 77 people. Rather, he claimed that this was an act of “self-defence” against the “state traitors” who opened Norway to multiculturalism. It is convenient for some to dismiss Breivik’s views as the ramblings of a mad narcissist and a psychopath. But strip away his more outlandish rhetoric and there is little to separate them from those frequently expressed on the pages of the conservative press. It was Breivik’s actions, rather than his beliefs, that distinguished him from other right-wing ideologues. His tropes of choice – the rise of “Eurabia”, the insidious influence of “cultural Marxism” – will be familiar to anyone who has read the work of Melanie Phillips or Mark Steyn, two of the writers cited in Breivik’s manifesto. The neoconservative author Norman Podhoretz titled his work on “Eurabia” World War IV. Breivik merely pursued such ideas to their extreme conclusion. To watch Anders Breivik, in the news clips available of him in the Oslo court where he is being tried for mass murder, is to see a smile on the face of an animal much more terrifying than any beast: a human fanatic, whose own mental processes have produced a monstrous creature. Media pundit spin 1.0: Breivik’s motives are incomprehensible. He’s craaaaaazy. Media pundit spin 2.0: Well, obviously Breivik isn’t crazy. He’s eeeeeeevil. The multicultists have been accusing those who oppose them, their victims, of mental or moral failure all along. What they say now about Breivik is what they’ve been saying about “the far-right” for decades. Meanwhile, thousands of Whites have been raped and murdered as a consequence of the genocidal immigration policies they support. The louder they insist we are crazy or evil, the more surely they identify themselves as our enemies. What a pig John Lloyd is. I will send a letter of support. The more support he receives the more people will awaken to the ongoing destruction of our societies. Breivik manned up and made a cruel statement. The more Whites dither the more such cruelty and worse will result on all sides. If you were to write a letter to Breivik , what would you say? For me it will be one of gratitude. It will also be one of asking the Norwegian people to forgive him. He was driven by idealism, a White trait that has been abused by a ‘tribe’ that is systematically causing Whites to destroy themselves through third world immigration. Whites are being manipulated by the jewish led Main Stream Media (MSM) into collective death. Time to wake up and smell its awfulness. I would write him that he is a tragic figure – and his victims too. A desperate man choosing a desperate way of acting and the poor brainwashed young people he killed. Normally they should have been in the same camp, since they belong to the same nation that is now endangered, betrayed and invaded. A giant, cosmic, overwhelming tragedy that we live in every white country in the world: we should feel solidarity in front of our extinction yet we have been brainwashed to hate each other and to hate ourselves, collectively. The most meaningful and sincere sounding thing he said, for me, was tweeted by Helen Pidd. “Unfortunately, the most conspicuous opponents of the New World Order are not sane Christians who uphold the traditions of civility developed with so much difficulty and misery by Greeks, Romans, and Medieval Christians, but rightist freaks who are even more repugnant than the Marxist-Feminist-homosexualist freaks. My jury is still out on Breivik but the sanctimonious self righteous always get under my skin. I would say that he is a craven Anti-White who pretends to be very “conservative.” Makes me sick! I would send him a copy of Kevin B. Macdonalds tome ‘The Culture of Critique’. Breivik hit the wrong target. Indeed political violence is counter-productive. Breivik had actually amassed one million dollars to fuel his rampage… imagine if he had used that to help one of Norways nationalist parties instead??!?!?! A good point about his jew-wiselessness. He seems stuck at the Gates Of Vienna (GoV) level, a jewish website that Tan has talked about here. Breivik’s natural progression would be for him to discover the central role of jews in our problems. A counterpoint to his jew-wiselessness is what Robert said in the previous post. What if Breivik carefully crafted a pro-Zionist image as a cover story? From what I’ve read I don’t think this is likely, but something to consider as the evidence comes in. I think Breivik is simply honest. His shocking action, right or wrong (in terms of ‘what’s good for Whites’) appears motivated by a deep love of his people. I am a Norwegian, and to say ABB is a jew lover, is to stretch it too far. It is necessary to publicly say you are anti-racist, a supporter of jews, and that you hate national socialism, in order not to get stamped as just another nazi by the media. What he has said during his trial, differs from the manifesto, and focus has been on traitorous journalists and leftist politicians in Norway. It also looks like the media have overstepped their demonization, as the most popular articles in the last days, have been people who are tired of the media twisting his words, to make him as pathetic as possible. This is a google translate of one of them. Interesting the argument that these events brought attention to troubles of multiculturalism. Basically I just came across this site, and didn’t know there was any discussion at all about this case…. Around that same time I had just been getting into serious reading of holocaust and WW2 revisionism, and I got trapped into that “moral” emotional feeling of sympathy for everybody affected by it: Germans, nazis, nationalists, extremists, fascists, the whole list, and I was in the middle, and still am, of trying to point out to my Greek and rather leftist in-laws that their perceptions of these entities is inevitably flawed by an intentional distortion in the popular media. Even pointing out that nationlists don’t have to be fascists don’t have to be socialists don’t have to want to kill 6M J’s and don’t have to want to kill anything. Then this thing happened. The overall effect was to feel like I had been walloped by a millstone, it was useless, I could not get through to them a concept, a fact, a point, faster than the MSM was churning out stories of nazi’s old and new beating up one person, killing 77 others, etc., etc. So, it’s interesting, I can’t suppose to know for sure how everyone would react, then, now and in the future, to the killing of 77 people but on my end it seemed more likely to provoke the “we need more MC to stop this kind of violence” syndrome. Anyway, interesting site, and good analysis of the anti-white attacks springing from the Boston bombing.